From freestanding ranges to wall units, gas ovens have a prominent spot in many modern kitchens. Preheating is an important part of using your oven. If it's too cold or too hot, your baked goods can come out flat, burned, crumby, overly dense or gooey in the middle. Your oven likely has a few built-in indicators that let you know when it's hot enough, but fluctuations are common. Using an oven thermometer gives you an accurate look at just how hot it really is inside the oven. Every oven is a little different, but most newer models have indicators that help you figure out when your oven is ready. Look for static symbols and indicators on the oven's LCD screen and control panel. Modern displays might show the full word as "Preheating" or abbreviate it down to "PrE." When these visual indicators disappear, your oven is preheated and ready for baking. Other ovens use lights to show the preheat cycle. Look for an indicator light that shuts off when preheating is done or a light that turns on when the oven reaches the right temperature. Some ovens use animated timers and symbols on the LCD display to help you monitor the preheat cycle. Some LCD displays show a series of bars that light up in ascending order, like stairs, as the oven temperature rises. The screen might also display the oven temperature in degrees Fahrenheit or Celsius as it increases toward the target temp. Another handy feature of many modern ovens is the sounds you hear as it preheats. Listen for beeps or tones before, during or after the preheating cycle. 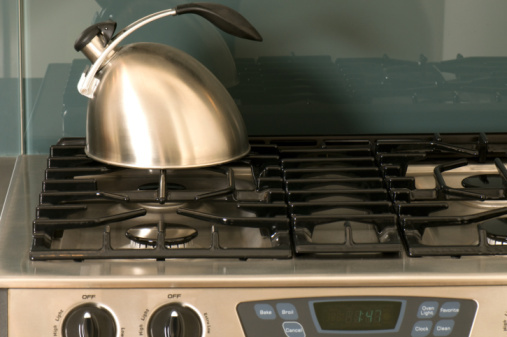 Many modern gas ovens use electronic controls and push-button pads. 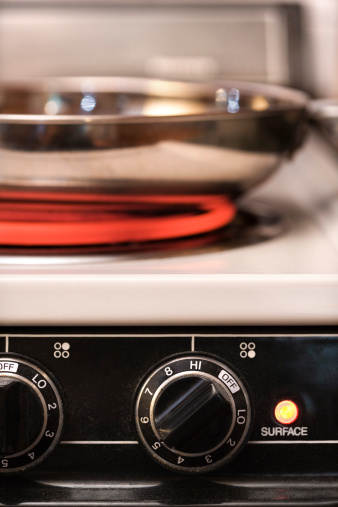 Shorter beeps and tones occur when you press the buttons to start the preheat cycle. A longer tone may signal the end of a phase such as preheating. Listen for the sound of internal fans in the gas oven, if the oven is so equipped. These fans may turn on after sensors detect that the oven cavity reaches the set temperature. Convection cooking uses fans to evenly disperse heat throughout the oven cavity. Some advanced gas convection ovens offer "full cavity" preheating that ensures the physical oven components, such as the racks and walls, all have reached the specified temperature. 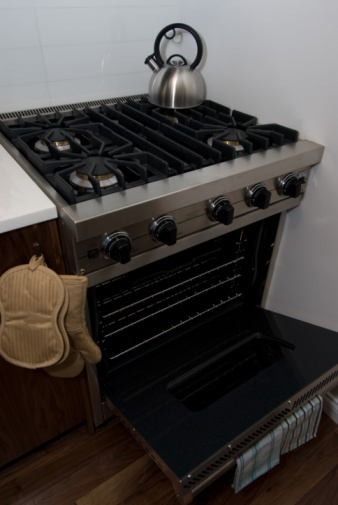 In older gas ovens, you may hear the gas shut off when the oven gets to the desired temperature. Special thermometers designed to withstand the heat of an oven can be a big help when figuring out the exact temperature. You can get a freestanding thermometer or one that hangs on the oven rack to check on the accuracy of the oven's temperature controls. For the most accurate results, peek at the thermometer through the glass oven door, as opening the door can cause a big drop in the temperature. Watch the thermometer as the oven preheats to see how it progresses. When the oven indicators show that it reached the desired temperature, look at the oven thermometer to see if it matches.